The professor yanks hard on the tablecloth, leaving the place setting atop it untouched. It feels more like a vaudeville-era trick than a science demonstration. Yet that’s what these summer-session students have just seen: a demonstration of Newton’s first law of motion. The bodies at rest stayed at rest—as they tend to do. “Physics isn’t that hard,” associate professor Jongsoo Yoon tells the students. That’s not to say it’s easy. Welcome to How Things Work, an introductory physics class intended for nonscience majors that was created by, and is usually taught by, UVA professor Louis Bloomfield. 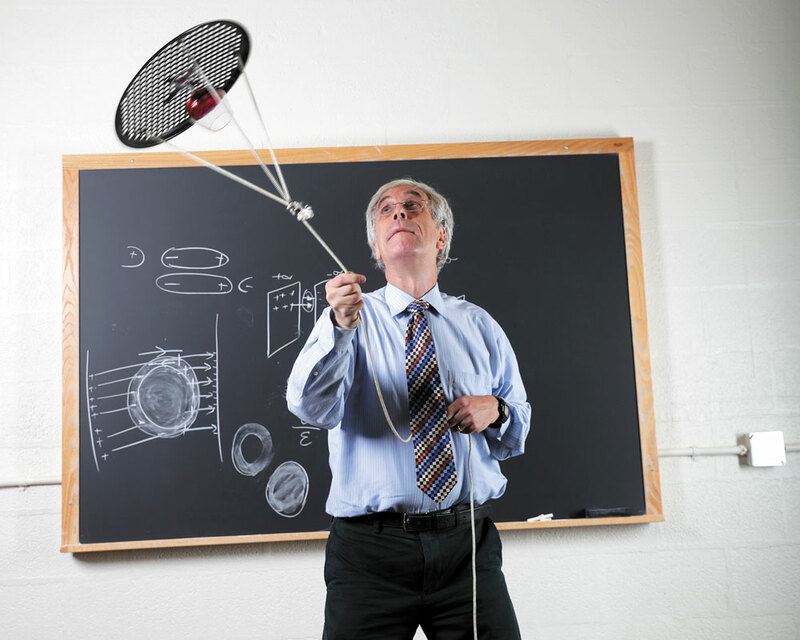 It teaches students the mechanics of how objects in the physical world interact with one another and why. Those secrets have proved popular. When Bloomfield started the class in the fall of 1991, he says he was expecting 20 to 25 students; 92 enrolled. The class went on to draw more than 200 students that spring. A few years later, Bloomfield says, more than 500 enrolled, forcing him to break into separate classrooms and use a live video feed. Instructors: Typically Professor Louis Bloomfield; at other times Professor Richard Lindgren or Associate Professor Jongsoo Yoon. Structure: Large lecture; primarily for undergraduate nonscience majors; offered during fall, spring and summer semesters; companion course (Physics 1060) also available. The course considers various phenomena and the functioning/movement of objects from daily life. Emphasis is on qualitative understanding of mechanical motion, including rotational motion, fluid motion, hydrodynamics, thermodynamics and mechanical waves. Bloomfield says he and the course’s other teachers use a case-study approach, which means lots of demonstrations. In the summer session, Yoon placed two identically sized cans of Campbell’s soup—one beef broth, the other beef vegetable—at the top of a ramp and asked students which one they thought would get to the bottom faster. The students agreed that the cans would get there at the same time. However, the beef broth beat the beef vegetable by a wide margin. Q. Why are cars designed to buckle (permanently deform) instead of recoiling (bouncing) when they are in an accident? A. Buckling dissipates the energy of the crash instead of leaving the energy in the car’s motion, where it can cause injury. If you fall from a height onto a trampoline (or a large air bag or air mattress), the trampoline bends—just like buckling cars at collision—spreading out the impact over a relatively long contact time. If cars recoil (without buckling), then the impact is concentrated over a rather short contact time, and it would be like falling from a height onto a concrete floor. Q. Why are the curves on a bicycle racetrack steeply banked? A. To turn a curve is to make a circular motion, and circular motion requires centripetal force—force toward the center of the circle. The banking tips the support force that the track exerts on the bicycle wheels toward the center of the turn and moves the cyclist’s center of gravity toward the center of the curve. 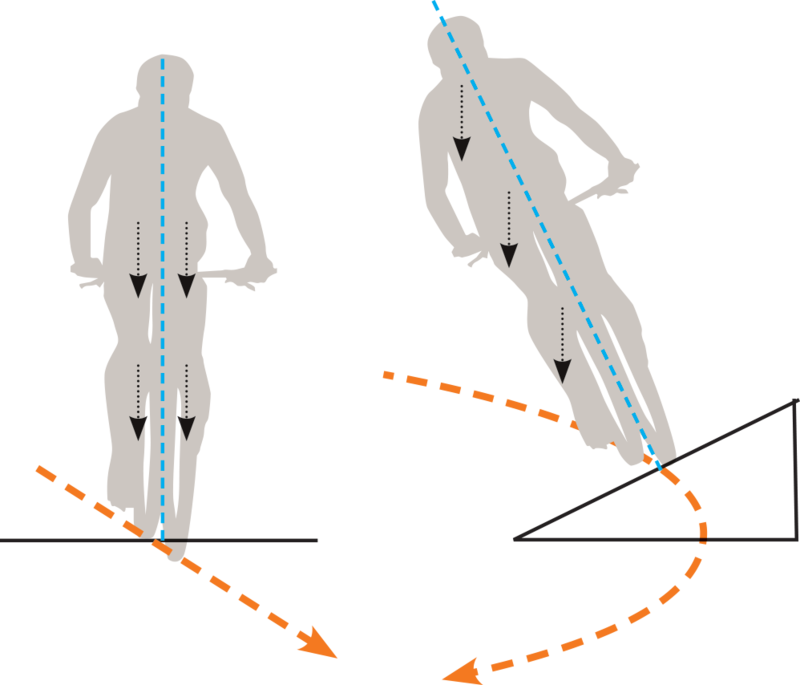 Gravity then exerts the centripetal force to allow the cyclist to complete the turn without skidding. Q. Just like a baseball bat, a tennis racket has a sweet spot. If a tennis ball hits the racket in this spot—its center of percussion—the racket’s handle does not accelerate. Why? A. As the racket’s center of mass accelerates backward, its handle rotates forward about its center of mass. These two motions cancel each other out. If the ball hits hard at the tip of the racket, the impact will make the handle move away from your hand. If the ball hits too close to the handle, the impact will make the handle move into your hand, making a full swing impossible. 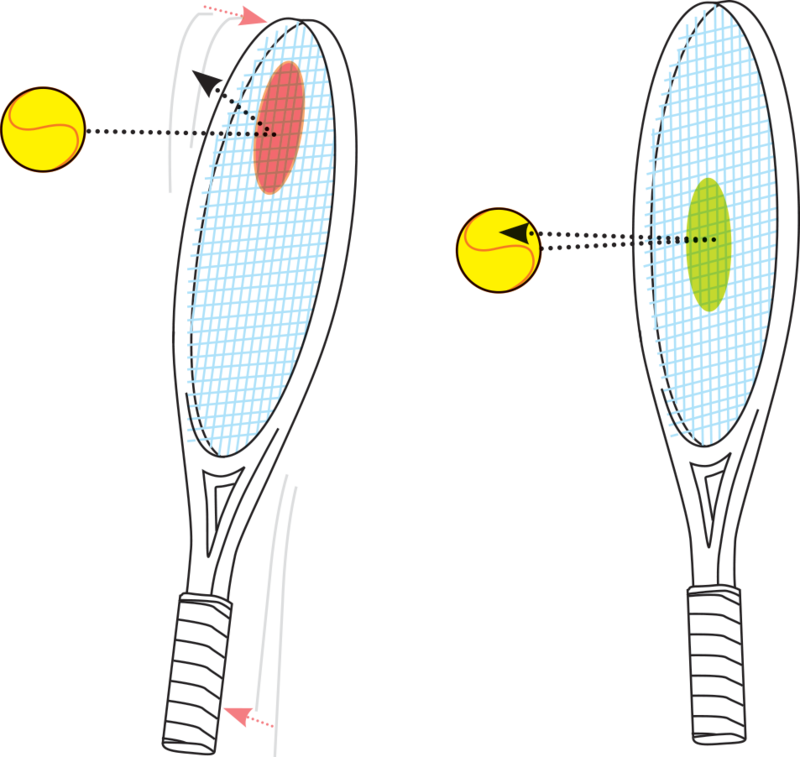 The center of percussion is in the middle of these extremes; if the ball hits it, there is no impact at the handle, and the racket’s full swing is focused on the ball. Q. 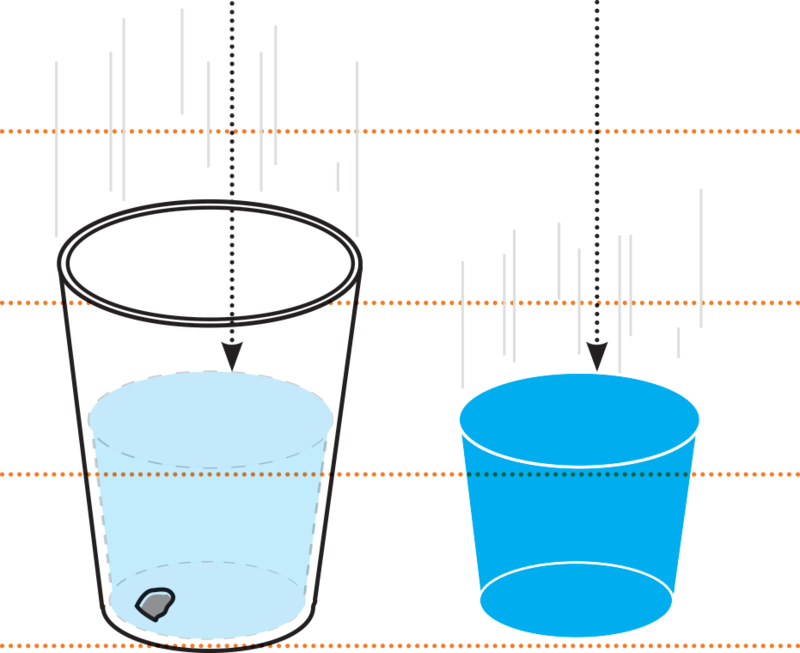 If you fill a Styrofoam cup with water, poke a hole in the bottom and drop it, will the water leak out the bottom on the way down? A. It won’t leak, because the cup and the water are both in free fall and locally weightless. Like a group of sky divers who jump together, they will stay together as they fall.